Of all the exercises that help in losing weight, cycling is the best form of exercise. To be fit and healthy, one needs to be active. Regular exercises and workouts may save you from deadly diseases like diabetes, mental illness, cancer, heart ailments, obesity or arthritis. Cycling is very beneficial for the ones who want to lose weight or combat the rising blood sugar levels. Riding your own cycle every day is the finest way to stay away from heart problems. Sedentary lifestyle, poor eating habits are the leading causes of so many diseases. Cycling is one such easy exercise which is low impact. People of all ages may cycle. 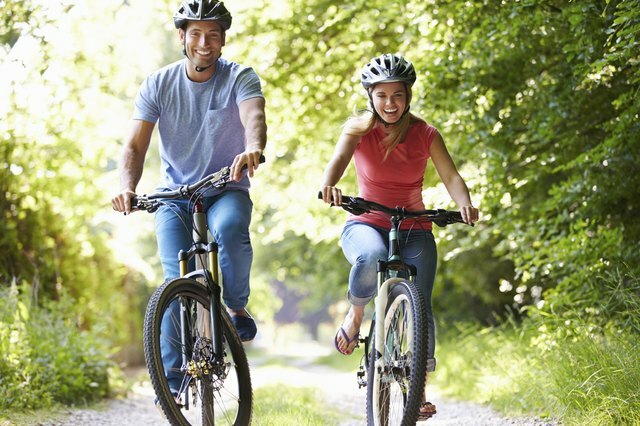 From young to old, everyone can indulge in cycling to get a plethora of health benefits. It is a fun way to exercise and burn body fat. You may also ride to your workplace every day to exercise your body and save on the fuel cost. Around 1 billion people ride a bicycle for transport and for exercise and recreational purposes. Cycling is that kind of exercise which causes the least muscular strains and injuries. It exercises all the major muscle groups. If you use a cycle regularly, you enjoy an array of health benefits. With this aerobic activity, your lungs, heart and blood vessels get a solid exercise. You will perspire, breathe deep and experience a rise in the body temperature. So, in a way, your overall fitness level will tend to improve. Some of the health benefits include improved cardiovascular fitness, increased muscle flexibility and strength, reduced level of stress, improved joint flexibility and improved posture. If you are looking to reduce weight, burn fat, cycling is an effective way to do that. It helps to raise the metabolic rate, build more muscles, and thus facilitates fat loss. Steady cycling can burn 400 calories in an hour. As per the researchers, there is a great link between exercising and cancer. Regular exercise can help you combat breast cancer and colon cancer. If you cycle regularly, there will be no chance of bowel cancer. It also reduces the probability of breast cancer. Diabetes is slowly becoming a global epidemic. The number of people suffering from Type 2 diabetes is increasing day by day. Those who cycle for 30 minutes every day, they have 50% less chance of getting Type 2 Diabetes. Regular cycling can fantastically improve balance, strength, and coordination. It will restore the body balance to reduce falls and fractures. If you are suffering from osteoarthritis, you may ride a cycle. Cycling is a low impact exercise and it will not stress your joints. Some of the cardiovascular diseases are high blood pressure, stroke and heart attack. Regular cycling will supply fresh oxygen to the heart and help prevent strokes. It will strengthen the lungs, heart and improve the blood circulation. So, the above 7 reasons for cycling are enough to propel you to ride a bicycle. It is such an exercise which may be enjoyed both indoors and outdoors. Thank you for the excellent article of the health benefits of cycling. If more people would workout, and cycling is a great way to do that, many of today’s health issues would decline. I recently suffered a pulmonary embolism, and am still recovering. The medics at my local emergency department said I would not have survived if I wasn’t so fit from cycling. Great post about cycling’s health benefits – if only more people took it up! Cycling raises your heart rate and gets the blood pumping round your body, and it burns calories, limiting the chance of your being overweight. Great points. I think for me one of the biggest benefits is that it helps reduce stress! Great helping post. Rgular cycling has been proven to have many fitness benefits, each physically and mentally. My brother was frantic when he realized that his bike was broken, and this article explained to me the reason why. You said that cycling for an hour increases the person’s metabolic rate and contributes to the burning of more than 400 calories. He is fitness conscious, you see. Anyway, I guess I need to help him find a good bike repairman, so he can get back to it again.